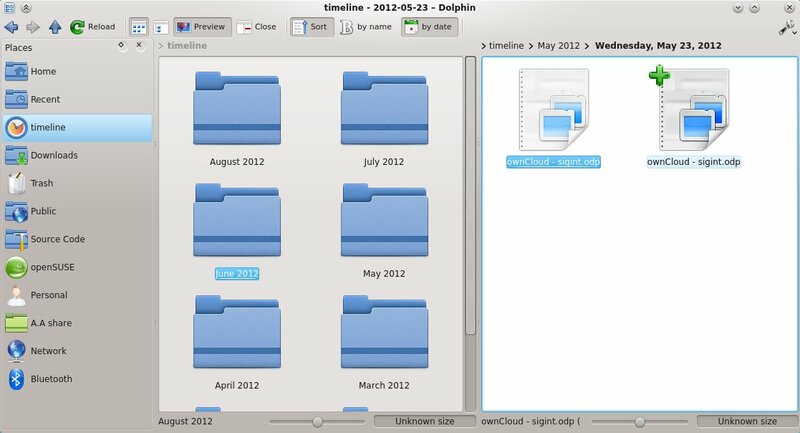 dolphin is coool, thanks,, excellent work !! One more great feature that should be exposed bye default, i dont know about making it the default start window, but having it in the sidebar out of the box would be great! Nice. I just tried and this works with folderview too. What does not seem to work is to have too different "homeUrls" in a splitview or did I overlook something? No, that probably doesn't work - and I certainly haven't gotten that... Sorry if I gave that impression! I agree with kaismh. File manager is for managing files. IMO, you shouldn't follow the open-dolphin-to-open-a-file mantra. 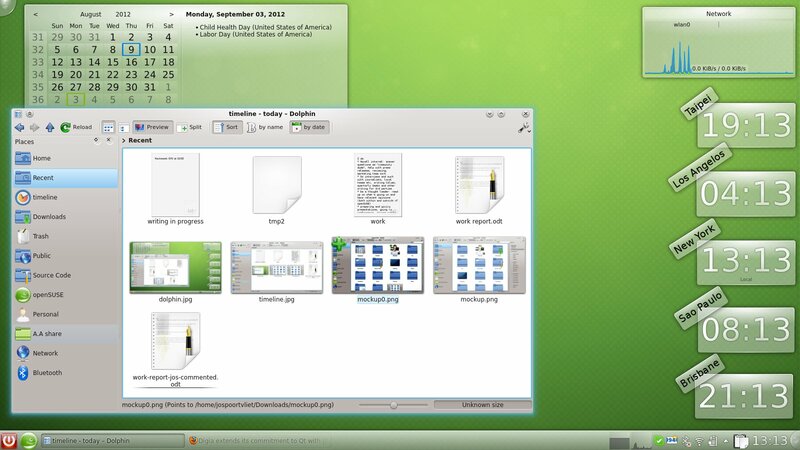 Application launchers should be used for opening files (or anything else for that matter). Or, a folderview on the panel or something similar. Ivan: sorry, but it does not work for most of users. In your scenario, you have to exactly remember both application name and path to file to open file. 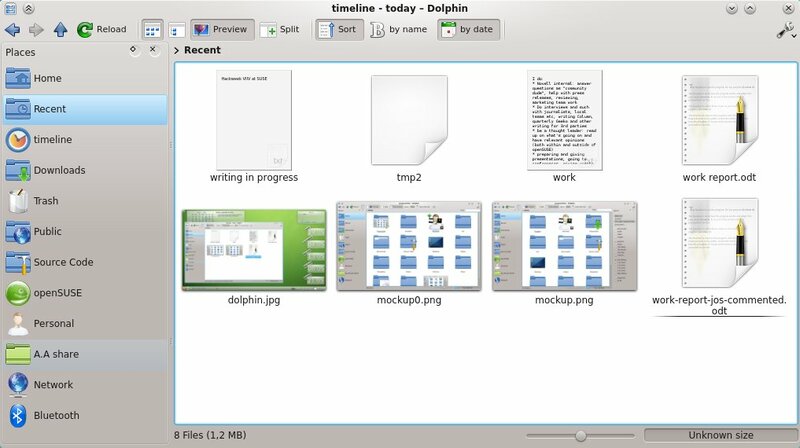 While using Dolphin, you must only remember path - then you may just click on file and KDE will do the rest. If you are unsure, you can see list of all associated applications and select one. 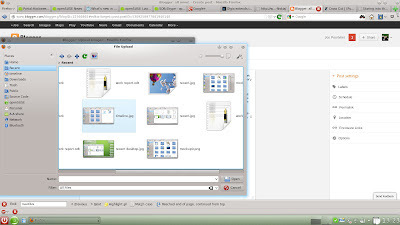 Imagine that you want to create new folder for some project. 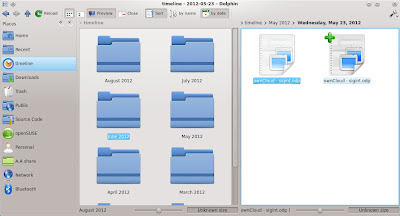 You create it with Dolphin, start some app, save file and navigate to folder you have been a while ago? Or just click RMB → Create new → filetype and click on that file? No, I don't think you should first open the application. I'm saying that the launchers *need* to provide direct access to the documents. This is the one of the main reasons behind activities, linking the files to them, applications reporting which files they open etc. To provide the workspace with the information of which files are important to the user. I usually create folders while saving the file. 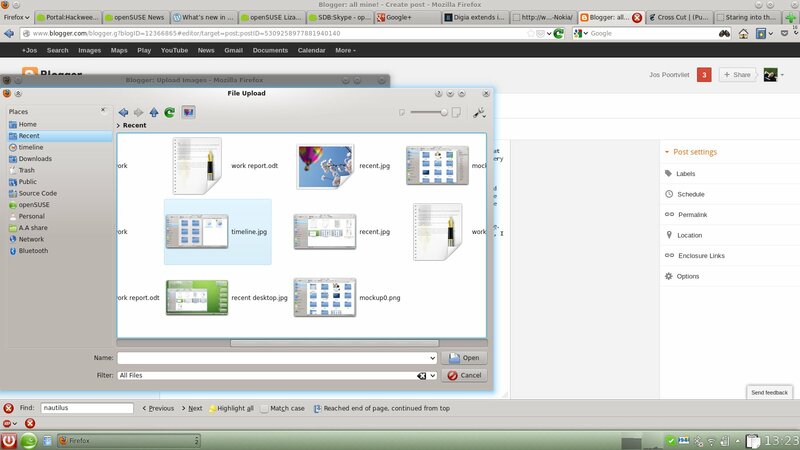 For example, I don't open dolphin, tell it to create a gimp image and click it; but open gimp, do something, save image into a new directory. 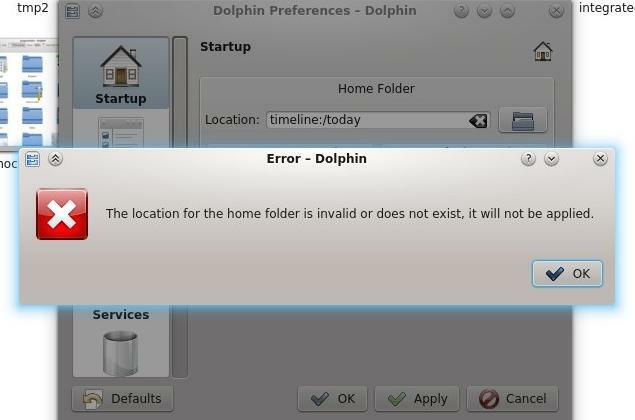 BTW, your point shows another problem with the time-based dolphin - you can't create a folder in 'Today' kio - so your use-case also doesn't benefit from this idea. "And may I hereby propose to make this the default in Dolphin? I know, it depends on Nepomuk running, but we're going there anyway... I expect that the 5.0 release of Plasma Workspace has a Nepomuk up to this task"
I should probably point out that the timeline kio slave only works for indexed files. Please do not make this the default. First, I can hardly imagine something more useless, when starting the PC in the morning, firing up Dolphin and seeing … nothing, exactly, as nothing has been changed on that day. Second this whole dynamic placement of things is completely against how the brain works. To work efficiently you have to change control into feedback control, as that's what the brain can do best (fast while not strenouos). As the brain saves positions, colors, shapes and so on this dynamic reorganisation of stuff means that your brain always has to scan the complete folder instead of knowing that you have to click the third icon for the task at hand. All said, some easy reachable shortcuts with the categories "today", "yesterday", "most recent documents" (containing the last n documents with n ≈ 10) seem like a great idea. .. and that's how it is already in dolphin 2.1! But it is flawed design. The "Today, Yesterday" etc doesn't work and take away important space. You need to use HDD to use it, and still takes space. With SSD you can not use it because access times are not updated so you don't see anything. Instead giving a user change to add own groups to sidepanel, they are forced to have "Search for", "Devices", "Recently accessed" and "places". Only the last one belongs to Dolphin sidepanel by default, devices (removables) can be in some situations. All other should belong to "search" sidepanel on right side, where user selects file types, date from calender view and types some search words. 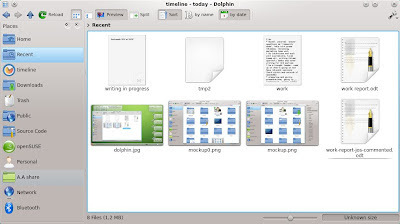 Dolphin toke few steps back one one forward with latest version. No, they still work, nepomuk does not depend on access times. There are some situations where it is not 100% dependable, I admit, but it works on my SSD (noatime mounted) just fine. I like the fact these searches are immediately visible as I surely don't want that search panel on the right to be there all the time - I use rather small dolphin windows most of the time. I admit I have to try to see if this works as I have quite a few places on the side but they do resize already and some are duplicates of these new ones. Small bug: dolphin checks if a certain setting is in nepomukserverc to check if file indexing is turned on. Of course, file indexing could be turned on system wide (by default), but if the user doesn't have that in nepomukserverc, then dolphin won't show the new goodies in the Places panel. Disabling and re-enabling file indexing will turn on the shiny goodies. Features are confusing. Dolphin confuses me. Yes, it can do things, surely scary. I suggest to turn of your screen or close your eyes to reduce confusion. What widget it's for show differents world time zones?? I can't do even a simple "Hello world!"